HomeCIE Spotlight: Australian mammal extinctions, can we prevent further losses? CIE Spotlight: Australian mammal extinctions, can we prevent further losses? 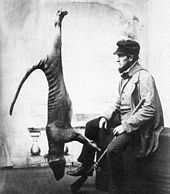 Did you know that Australia has the worst rate of mammal extinctions in the world? More than a third have become extinct since European settlement​, or are currently threatened with extinction. Can we help those who survived to flourish again or are we fighting the inevitable? Dale Nimmo and Euan Ritchie call for the public, governments and non-government organisations to support projects that seek to rewild Australia and help restore its natural glory. Read all about it on The Conversation: Mourn our lost mammals, while helping the survivors battle back.